Students for peace seem to be waging an uphill battle, but those involved refuse to give up the fight. I’d like peace to win out, but the challenging competition of violent games, horrific news stories, crazy reality shows, famine, drought, warring hotspots, and world economic stress makes the odds seem astronomical. Peace will take all the energy our young people can muster. I don’t put much stock in politicians figuring out the path to peace, and as much as they mean well, diplomats finding the right words to magically make everyone get along probably won’t be the route either. Can our children lead us? When the United Nations member states unanimously adopted (1981) September 21st as Peace Day it could have been left an obscure note on the calendar, but it wasn’t. 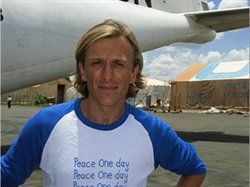 And that day has become a celebration for the Peace One Day movement, founded by Jeremy Gilley. It is also a day where we can concentrate on humanitarian help efforts, such as vaccinations, feeding the hungry, and ways of sustaining peace. I know we’re talking about one day, but that one day has a proven record for reducing violence in some of the most violent areas of the world. Each year on September 21st students are encouraged to get involved and gather for peace in whatever way they’d like. But 2012 is special. This year, the goal is to achieve the largest global truce—ever—on that one day. Educators, parents, and anyone around the globe can help guide students and children as they organize for the big day and its events. Check the Peace One Day website for more information as well as video and classroom suggestions: http://peaceoneday.org/. For more, please read Student Peacemakers Pledge Memorable International Day. Don’t let your children down; support them on September 21st and beyond.